Take the M train to the 36th Street station. Climb the stairs and exit the station and greeted by the six-story edifice built by Standard Motor Company in 1919. Enter the building. Push the elevator button and be whisked to the roof. Leave the city behind and enter a robust urban farm with views to the bustling New York metropolis below. I was welcomed by Bradley Fleming, Brooklyn Grange’s former Farm Manager extraordinaire at Flagship Farm and best man at my niece’s San Franciscan wedding the weekend prior. Atop the roof flourishes a one-acre farm totally hidden from the sidewalk below. Bradley was busy completing the final tasks for the farm’s fifth season. With one more week of their Community Supported Agriculture (CSA) boxes to be delivered, he expected them to be filled with chard, kale, eggplant, sunchokes, salad greens, green tomatoes, and other delectables. Workers broke down and composted the no longer producing tomato and pepper plants. Scattered around the site were three bee hives producing honey and winding down the job as the farm’s pollinators. 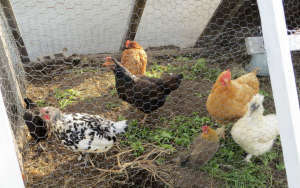 Laying hens offered eggs. A compost bin accepted spent vegetative matter which was processed in part by a solar powered forced air system. Fortuitously, the Standard Motor Company concrete building was built to construction standards that could easily support the weight of Rooflite, the composted soil mixture blend, rain and irrigation water, equipment, and farmworkers. The existing parapet walls met the height requirements for the “fence,” such that workers and guests are protected from falling to the street below. The rooftop drainage system functioned properly and only had to be modified slightly with porous plastic caps that allowed enough water to remain on the roof to irrigate the plants, but allowed any excess to be discharged. It was as though 100-years ago that the architect’s knew the building would once support a green roof to grow produce! Then, planting rows, walking paths, and produce washing and aggregation station were sited. Now five years later since initial construction, farming protocols are established. A sprinkler system waters newly planted seed in early season for germination. Drip irrigation lines follow each planting row and run for 20 minutes three times per day during the peak season. Plantings are sequenced such that produce is available from mid-May through late October. Being a small, specialty farm, allows Bradley to experiment with unknown produce varieties. 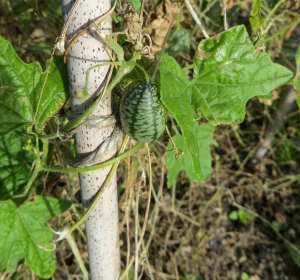 I had Mexican Sour Gerkins for the first time; a miniature, watermelon look-alike cucumber growing on a trellised vine. All produce is organically-grown, but not certified. As with any farm operation, Mother Nature can have her way. Keeping the soil on the roof, will be the biggest upcoming winter obstacle, as winds can blow fiercely on the roof. This winter they are testing a ground-up hop mixture as a wind cover, that will also compost and provide nutrients for next spring. To expand their business with the expertise gained from Flagship Farm, Brooklyn Grange now offers design, consulting, and construction services for other building owners that want green roofs–whether food producing roofs or solely vegetative roofs. Sedum roofs require much less soil coverage and water, which significantly reduces roof weight and therefore are suitable for those structures that are not as robustly built as the Standard Motor Company’s building. Weddings, farm to table events, and rooftop yoga are other services that are available on Brooklyn Grange’s urban oases. 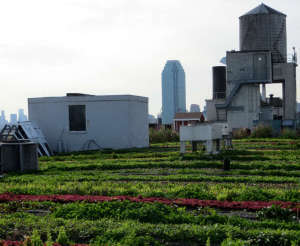 Whether these intense green roof farms are replicable across the country remains to be seen. The lack of urban growing space, the unbelievable amount of traffic, and the green roof incentives are a few of the many reasons that Brooklyn Grange has been successful in reducing the miles that great food must travel to satiate a customer base yearning for fresh, local produce.